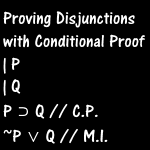 Here we look at how to prove disjunctions through conditional proof. This lesson is available as a video or as text. Scroll past the video for the text version. 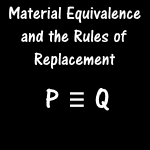 First, let's take a look at the rule of material implication. This rule shows that a conditional is materially equivalent to a disjunction where the first disjunct is the negation of the conditional's antecedent, and the second disjunct is the consequent of the conditional. Remember that the conditional here is just a material conditional. It expresses relations between truth values, not cause and effect. Even though it doesn't richly capture what we always mean by "If ... then ...", it normally captures the logically relevant characteristics of if-then statements. A conditional is true for three combinations of truth values, and so is a disjunction. When we negate the first disjunct of a disjunction, its truth values line up with those of a conditional, as seen in this truth table for material implication. This works well for a disjunction that is already in the form that corresponds to a conditional. 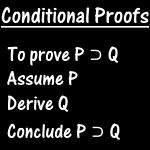 But what if we want to prove one of the form P ∨ Q instead? This is essentially the same with the additional step of double negation. 15. (P ∨ Q) ≡ (Q ∨ P) // 7,14 Biconditional Intro. 24. (P ∨ (Q ∨ R)) ≡ ((P ∨ Q) ∨ R) // 11,23 Biconditional Intro.